The best and most unique glass engravers in Ireland. we are situated in the beautiful Derry City Craft Village & we are the best and most unique glass engravers in Ireland. 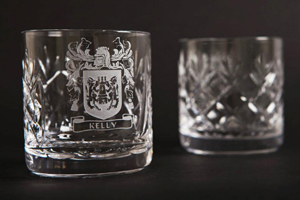 Established in 1991, City of Derry Crystal is one of few remaining companies who still hand cut crystal in Ireland. We believe the old-age skill of hand cutting allows for truly bespoke designs. Our City of Derry Crystal shop is situated in the beautiful Derry City Craft Village. There are many other talented crafts people trading in the village which makes it well worth the visit. Our workshop is also situated in Derry City Craft Village. Although we are not licensed to invite you inside (nor is there much space to do so!) you are welcome to view through the windows. 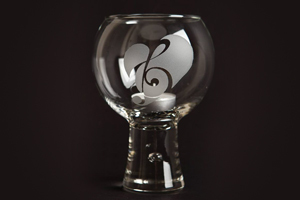 With either hand engraving or sandblast glass engraving - or both - and your chosen glass or crystal gift, award or trophy will stand head and shoulders above any other and will be admired by all. Hand engraving glass is accomplished using a dentist drill and diamond encrusted burrs. Wood and rubber burrs are also used, to polish out eyes, hooves, shoes and boots etc; - things which are normally shiny in real life. A Glass Scriber sandblasting machine is used for commercial glass engraving and all masks (stencils) are produced in-house. City of Derry Crystal is situated in the beautiful Derry City Craft Village. It's well worth a visit, particularly in the summer months. You can see our location to the right.